Be an art-infused classroom with my interactive coloring sheets plus writing prompts for all major holidays (over 90 unique designs to use all year long)! 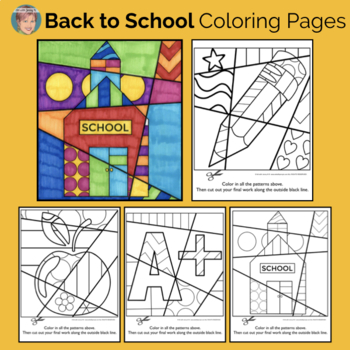 My original interactive "pop art" coloring sheets are a teacher and student favorite! This popular collection features coloring sheets and writing prompts for Back to School, Johnny Appleseed, Halloween, Christmas, Winter (penguins and ice skaters included), Valentine's Day, St. Patrick's Day, Easter, Earth Day, Cinco de Mayo, Spring, Summer, End of the Year and more. Not only are there over 90 interactive coloring sheets in this set, but writing prompts as well. 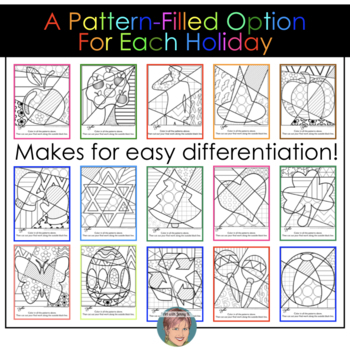 Also, I've included a collection of pattern-filled variations for easy differentiation. This product is designed for grades 3 and above... all the way to adults! For younger (Prek-1) students you might like my pattern filled coloring sheets. Not only are these coloring sheets a ton of fun, but they make great think-and-solve problems. “I found that my 5th/6th graders come to me and because of the focus on testing, never played with color or design or patterns. Your products give them that opportunity and I’ve seen so much improvement in their attention to detail as well as noticing patterns, lines, etc. It’s so much more than “just coloring.” ~E.D. 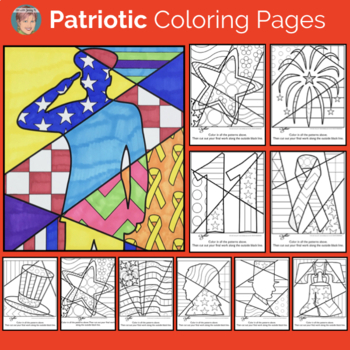 These coloring sheets are interactive because it is the student who decides on all of the designs and colors by drawing in patterns to make the composition. No two sheets will ever be the same and the more of these the students do, the better they get at making decisions and solving design problems. No more coloring sheets that look exactly the same! See my individual sets of interactive coloring pages. ~writing prompts including a blank one to make up your own. ~ONE pattern filled design for differentiation (give to students who might struggle too much with interactive). These interactive coloring sheets are perfect for any occasion, but also shine during testing season! They are a great way to wake up the brain prior to a big test, or a way to give your students some creativity at the end of a long testing session. 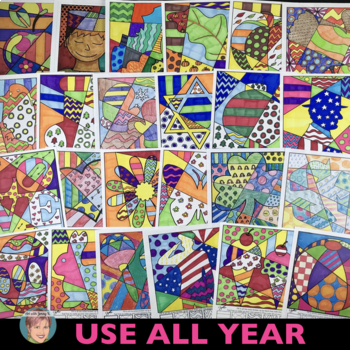 As an art teacher, artist and lover of all things “artsy,” I am a big proponent of “art for art’s sake.” My interactive coloring sheets are designed such that they can be used any time in your classroom for the sake of making art. However, I am a teacher so I understand how hard-pressed classroom teachers are for time. You might not feel like you can give up precious lesson time to let the kids “color.” In that case, I suggest that you can use these interactive sheets as writing prompts. I have included writing prompts for all the holidays and seasons included in this set. I hope you have fun with these, I know my students and I do! You may also like my Pop Art Math fact coloring sheets. Follow my store and you'll get email notifications when I post new products - they are always 50% off for the first 48 hours after publication. Bundles are always highly discounted right from the start! Sign up to get FREEBIES to your email from Art with Jenny K.
The purchase of this product is for one license and is for PERSONAL USE ONLY. © Copyright 2014 Art with Jenny K.® ALL RIGHTS RESERVED. Permission is granted to copy pages specifically designed for student or teacher use by original purchaser or licensee. The reproduction of any part of this product is strictly prohibited. Copying any part of this product and/or placing it on the Internet in any form (even a personal/classroom website) is strictly forbidden. Doing so is a violation of the Digital Millennium Copyright Act (DMCA). Purchase extra licenses for others to use this resource at a discount.